"I had contacted several companies searching for someone to build a backyard fence. Two companies never called back, one said they wouldn't do any job under $1000. Another told me how difficult this job would be ... partly due to the location. When I contacted Billy at BFD he continued to keep up contact until we had the details worked out. He even stopped at the property in Guelph to check it out. It was a special order and it came on time. Last minute, as the crew were starting to do fence posts, my neighbour wanted to dispute the location - even though we had talked about it several times before. It was a stifling hot day. The crew foreman kept his cool and the posts were installed. The fence is great. My neighbour is happy." "Nancy and I would appreciate if you forward our sincere thank you to the following members of the crew that co-ordinated and installed our ornamental fence for doing a great job. They are namely: Brad, Ken, Peter, Rick and Tony"
"Thank you, all of you for a job well done. From the competent and detailed quote, to the courteous and friendly staff at your office, and the fellows who carefully dug around the wires, to the guys who did a splendid job putting up the fence. We wanted you to all know how much we appreciated your professional approach and your skillful and good work"
"Thanks for the great job on our deck. I know we will get many years of great use from it. Everyone we dealt with from BFD was helpful and courteous." 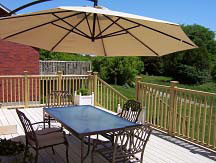 "Thank you so much for all of your hard work on our deck. Especially for your patience with all of my questions and details! It was a pleasure to have you build our deck for us. We will enjoy our deck now."